Story Analysis: ilomilo – A Critical Hit! 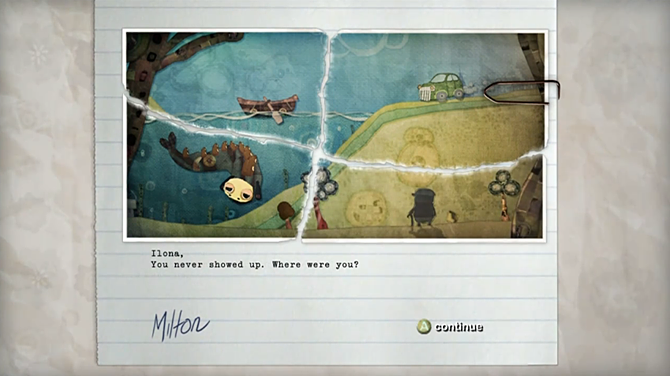 ilomilo is divided into four chapters, each containing nine puzzles (six regular puzzles, and three “bonus” puzzles). 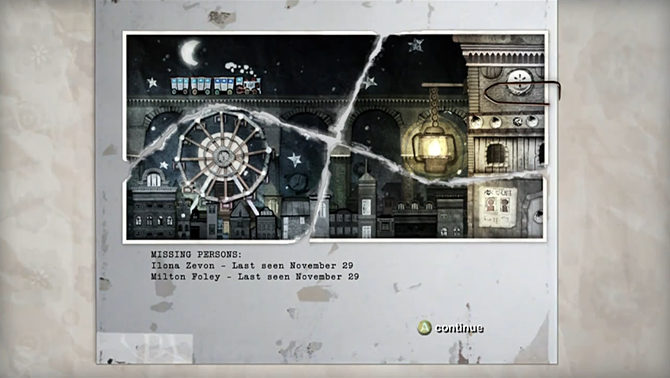 There are three stories that run concurrently through the game, each broken into four parts to coincide with the four chapters. These are ilo and milo’s story, Ilona and Milton’s story, and Sebastian’s story. The main story, told between each chapter, is presented in the style of a children’s storybook. ilo (the red one) and milo (the blue one) are two bestest friends, who live on opposite sides of a park. Every morning, they meet in the middle of the park to nibble on maple leaf flavored biscuits and drink apple tea. At sunset, they would each walk back to their homes. But each morning, it seems as if someone has modified the paths in the park, making it more difficult for them to get together and do their bestest friend things! Or maybe they just don’t have the greatest memories. 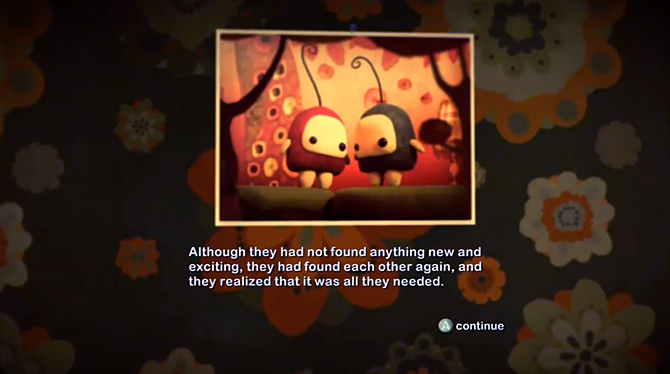 This leads into the puzzles, which involve you helping ilo and milo to meet up somewhere in the middle. However, the puzzle world seems to have only a vague connection to the storybook world. For one thing, these strange gravity-defying paths don’t really resemble anything that could be described as a park. Also, ilo and milo don’t start from their homes, which don’t seem to appear anywhere on the paths. The puzzle world is merely a symbolic representation of the overall story. But I’ll get more into that later. 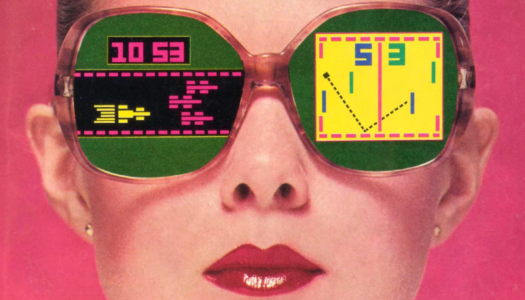 In the puzzle world, you collect trinkets that fill a memory meter. 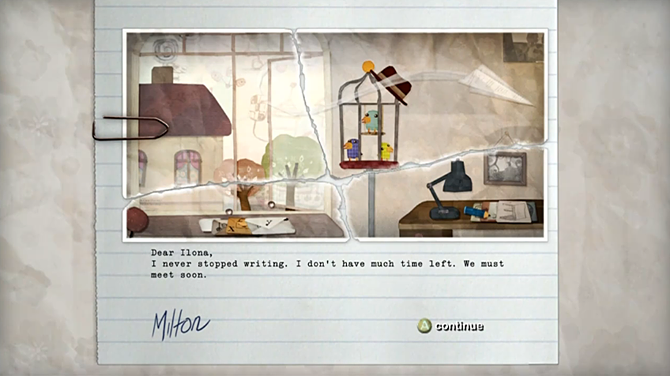 Each time the meter is filled, you unlock a fragment of a photo that has been divided into four pieces, and a note from a correspondence between two people named Ilona and Milton. Not only are their names unusually similar to “ilo” and “milo,” but their notes contain elements that also appear in ilo and milo’s story. Initially we know nothing about these people, other than that they’re friends who hadn’t seen each other in a long while, and began exchanging letters again after a chance meeting in a park. They mostly reminisce about the good old days, but Milton insinuates that he doesn’t have long to live. Back in the storybook world, ilo and milo realize that they’re going to have to return to their homes soon, and the though of being apart again causes them to cry. They cry so much that their tears form a lake, which they then fall into. In their letters to each other, Ilona and Milton fondly recall a lake they used to visit regularly. Ilona would like to visit it again, and Milton mentions he still has his rowboat. But when he goes to the lake, Ilona never shows up. The photo shows a man watching a car pass by, resting on a cane. Ilona and Milton are two elderly people. Milton hasn’t received a response from Ilona in some time; technically, never received a response before heading to the lake. He writes to ask why she no longer answers. 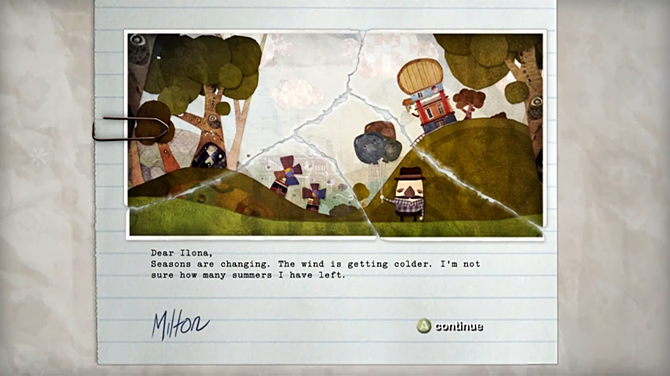 A letter signed Dr. Jacob Gris informs him that Ilona no longer lives there, and to please stop sending letters. This is followed by a letter from Ilona. “Why did you stop writing?” she asks. “I’ve asked them if I could meet you, but they won’t let me.” It sounds as though she might homebound and/or receiving home health care, and her doctor must be screening her letters. It’s possible that when Milton started suggesting she sneak out, they suppressed the letters and asked him to stop writing. But it appears Milton has figured out a way to bypass them. Ilona had written, “if I could, I would fly away from here. Fly like the paper planes you used to fold for me.” Milton folds his next note into a paper airplane, and flies it through her window. Note the drawings on Ilona’s desk. She’s an artist, just like ilo. There are a few other interesting things to be found in this image, but I’ll come back to them later. By the time ilo and milo finally find each other through the ocean of papers by the lake, the sun has set. But they’re not ready to head back to their homes already, so they decide to go find the sun. 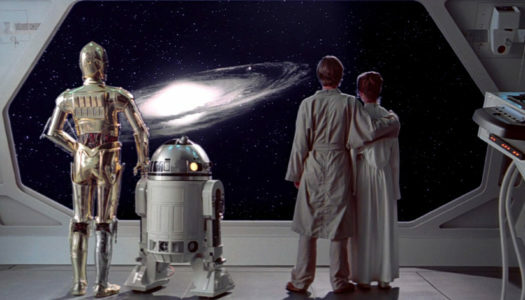 However, it’s so dark outside of the park that they once again lose sight of each other. Ilona and Milton put together a plan. They’ll meet by the old Ferris wheel in the middle of town, and take the night train out of town. “Let’s never turn back,” Milton says. They’re never heard from again. “Before ilo and milo could find the sun, the sun had found them, and the friends could finally find each other. They felt complete, as if they were home. I’d like to pause here for a moment before going further. If you’re someone who originally wasn’t planning to play the game but are now considering it, this is here as a nice place to stop reading, so you can return to the article later after playing through the game. Next I’ll be getting into Sebastian’s Story, the Autumn Tale DLC, and how the stories relate to each other. 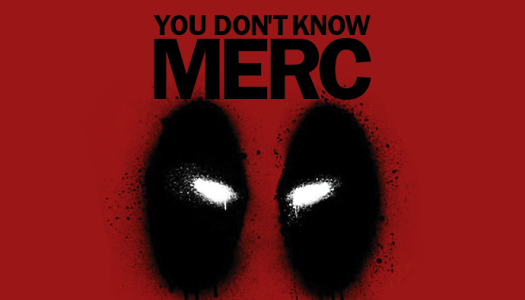 So if you stop here, there will still be at least a few parts of the game that will be new to you. Figured I’d give you the option, at least. How Are The Different Worlds Connected? “I don’t want to dig too deep into the story of ilomilo and point out absolutely everything that happens and what is real or not, but there is some stuff that I do want to share. “The ilomilo universe consists of different realities. “The first one is the physical reality, in which you as the player exists. When watching the storybook sequences, you are still in this reality. “When playing the game and solving puzzles, the second reality presents itself – this is the world of memories and dreams, a reality which is not physical. You might be asking yourself, “but how can the storybook world and Ilona & Milton’s world possibly be one and the same?” It appears the author would like to leave it up to interpretation to a degree, but here’s the conclusion I’ve come to based on little hints. In previously mentioned the blog entry, Flesser also reveals that Ilona was an artist and Milton was a writer. You can see Ilona has been doing some sketching at her desk. But what’s even more interesting are the images framed on the wall. Taking a closer look, the one in the upper right corner appears to show ilo walking away from us, possibly holding hands with an out-of-frame milo. The lower image is harder to make out, but the background shapes at the very least resemble the backgrounds of the storybook images from the first chapter. This suggests to me that perhaps ilo and milo were storybook creations of Ilona and Milton, based on themselves. Whether they actually had any books published or not is unclear, but I believe they collaborated on a series of ilomilo stories, and these are what we’re reading in between chapters. Another interesting item in the photo is the bird cage. 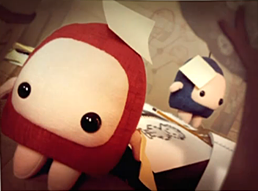 In the puzzle world, each level contains three hidden Safkas—creatures that resemble miniature ilo and milos—for you to hunt down. They come in three different colors, which just so happen to be the same colors as the birds. 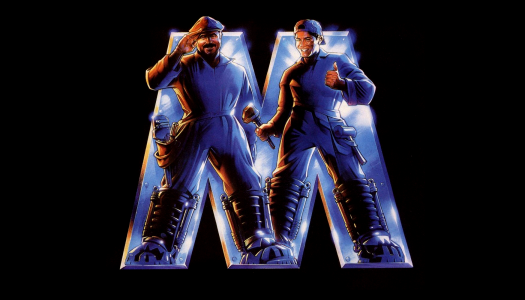 The hat on the birdcage is a reference to the hats the Safkas wear if you replay a level where you’ve already found them. 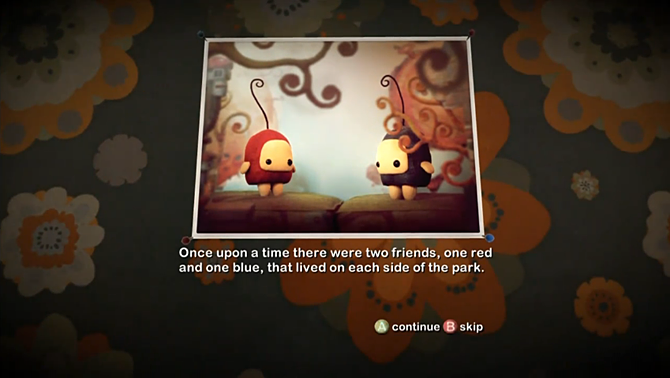 While the birds definitely relate in part to the Safkas, I think there’s a second part of the equation, which I’ll get to in the section on the Autumn Tale DLC. On a side note, the Safkas are named for Melanie Safka, a folk singer/songwriter who had a major hit in 1971 with “Brand New Key.” The song is about a girl with a new pair of rollerskates (an old style that required a key to tighten), and is trying to attract the attention of a boy who has a brand new key. Some have claimed the lyrics contain sexual innuendo, but the lyrics are more likely just an analogy for wanting to start a relationship with someone. The interesting thing about the Safkas is they only appear in the puzzle world, never in the storybook world. Perhaps we just haven’t been shown any of the storybook tales that involve the Safkas? Or is the dream world a symbolic representation of Ilona and Milton’s lives and memories, in the style of the stories they created? Either way, the Safkas aren’t the only thing in the puzzle world that aren’t referenced in the storybook tale. Which brings us to what happened to Ilona & Milton. 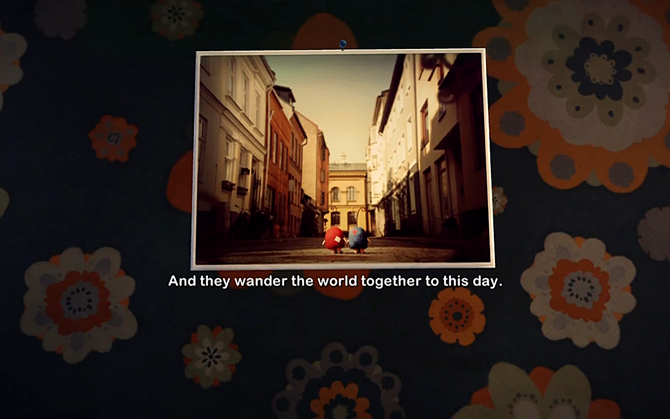 In the storybook world, ilo and milo simply walk off and wander the world forever. However, in the puzzle world things end a little differently. 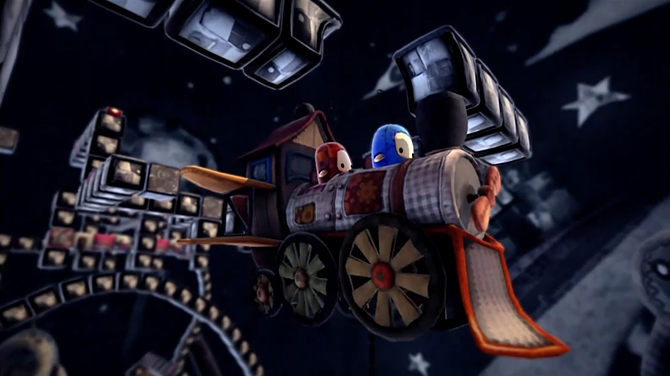 The final puzzle involves getting ilo and milo onto a train. Once boarded, the winged train undocks, and flies off into the night sky. There’s no doubt in my mind that Ilona and Milton made it onto the train. The question is: what happened after that? Did they just want to go on one final adventure together, traveling the country in their final days? Are they still alive? The Autumn Tale DLC contains some additional clues. But first, a brief detour into Sebastian’s story. Sebastian is a strange, quirky, sometimes arrogant and narcissistic being, who resembles an old man and rides a giant winged creature. 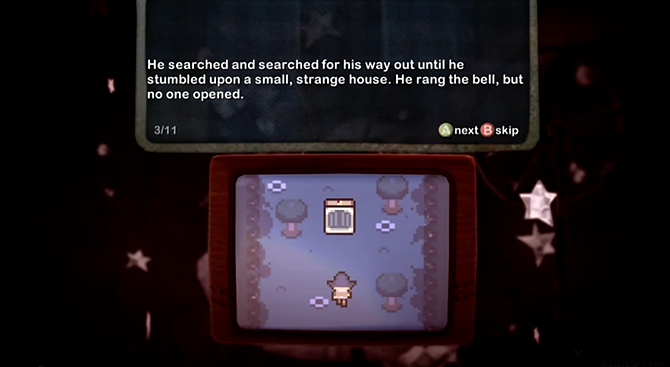 He functions as your guide—with dialogue by level designer Martin Blomkvist—coming out of his box-shaped house to help lost travelers like yourself, by instructing you how to use new gameplay components as they appear. 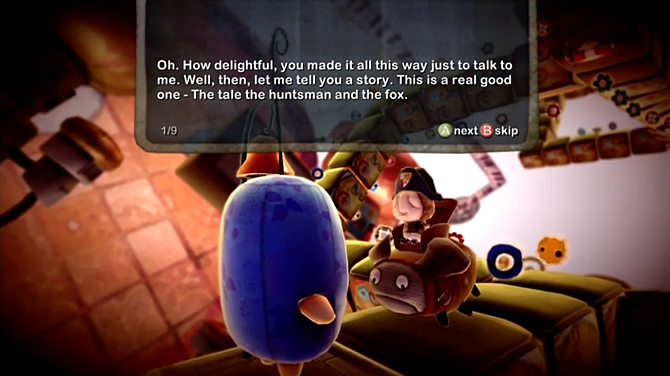 But on the first bonus level of each chapter, Sebastian instead comes out of his box to tell you a story. It’s a fairy tale, but not in the Disney tradition. This is an old-fashioned, bleak fairy tale in the vein of the Brothers Grimm, or Hans Christian Andersen (whose original version of “The Little Mermaid” ended with the character dying and dissolving into foam, because mermaids have no soul). The story involves a huntsman, whose fiancé wants a fox fur. He goes out into the forest to look for one, but when he finally finds it, the fox begs for its life. The huntman agrees not to shoot it. 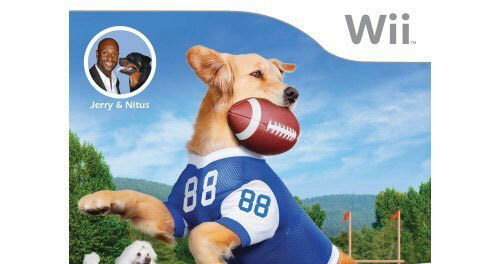 But his fiancé is livid, and demands a fur. The huntsman goes back out, wanting to please her, and encounters the same fox. The fox agrees to give up its tail. But it’s not enough—the irrationally demanding fiancé says she will leave the huntsman if he doesn’t bring her a proper fur. The huntsman once again encounters the fox. But this time the fox has a warning: the fox exists to help travelers find their way out of the forest, and if the huntsman kills the fox, he will be lost in the forest forever. The huntsman calls this bluff, and shoots the fox. Unfortunately, it turns out it was no bluff, and the huntsman is unable to find his way out. After searching all night, he eventually finds a strange, empty house. He goes inside, but it locks behind him and he’s unable to get back out. His fiancé worries, as days pass without his return. She eventually forgets all about the fur…but she never forgets the huntsman. It’s said that the huntsman eventually replaced the fox, coming out of his box-shaped house to help lost travelers. Like yourself. Although seemingly unrelated at first glance, Sebastian’s story shares a common theme with the other two stories, which is star-crossed relationships—two people kept apart by forces outside of their control. But while the huntsman will likely never see his fiancé again, ilo and milo are always able to find each other again, and Ilona and Milton are able to be together in the end. The only thing that strikes me as odd is: if Sebastian really is the huntsman, he seems strangely arrogant and self-absorbed for someone who’s gone through such a terrible experience. But I suppose anything is possible. Perhaps Sebastian is a being who is able to travel between different worlds or stories of various genres, helping characters get back on track anytime they’ve wandered into an area they shouldn’t be? I’m reaching, but it’s an interesting thought (and would explain the random indie game cameos). One day, while wandering the world together, ilo and milo encounter a trail of maple leaves. They decide to follow it, hoping they might find something new and exciting. However, they don’t notice that the trail splits into two, and before they know it are once again separated. Some time has passed since the end of previous chapter, as indicated by Sebastian’s exclamation: “Hello thumbcreature, long time no see! 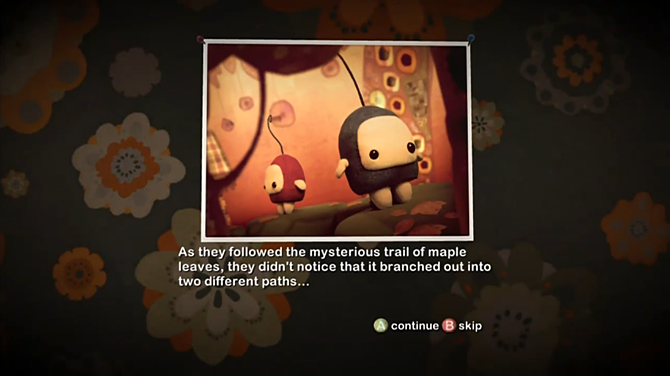 What have you been up to for so long?” Autumn Tale adds two chapters worth of new levels to the game, but unfortunately only a single chapter of story spread between them (and no new story from Sebastian). Though I’m sure this marks the first time someone has ever complained about there not being enough story in a puzzle game. And in the final piece of the photo, two figures are seen in the distance through the sliding glass door. Symbolically, it represents the idea that Ilona and Milton might be wandering towards the house as we speak. But in actuality, it’s Kalliope and Saffron going for a walk, before the winter comes. This chapter reveals a lot of information in a very short amount of space. We know for sure from this that Milton had a daughter, though we might also be able to assume that Ilona and Milton both had kids together, and Kalliope and Saffron are siblings who live a distance apart. To go one step further, I might theorize that the line “they might be looking for us this very moment” could be a reference to the Safkas, which look like young ilomilo creatures. 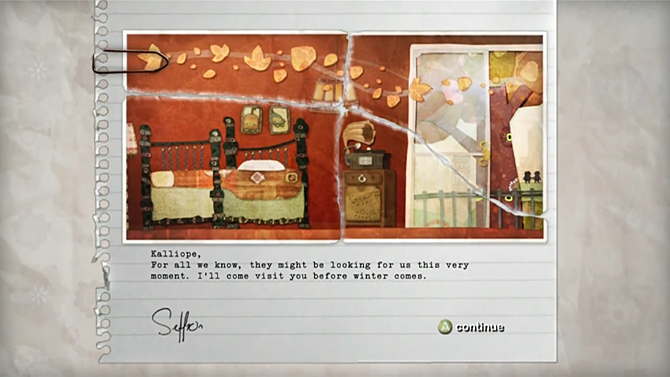 While the Safkas’ colors that are based on the birds mentioned previously, perhaps the Safkas actually represent Ilona and Milton’s children. Could Kalliope and Saffron have a third sibling? It’s also confirmed that Milton was terribly ill, and that “they aren’t here anymore.” It sounds almost as if their bodies were never found, which once again raises the question: where did they go? I like to think that they maybe, somehow, took the train to the afterlife. It’s said that everyone dies alone, but it’s sort of poetic to imagine that they discovered a workaround. Either way, to an extent they live on through the characters they created, and the stories that their children perhaps continue to tell. Meanwhile, back in the storybook world, the two trails of leaves eventually merge, and ilo and milo are reunited once again. 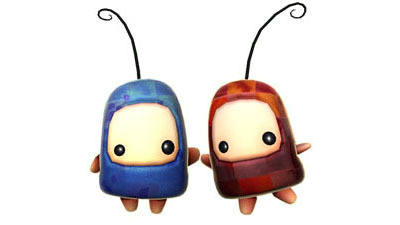 I can only hope that we might see more of these two silly thumbcreatures. Did you enjoy this story analysis? Would you like to see us do more? Please let us know by responding below, or by clicking “Contact Us” on the sidebar. I indeed enjoy this analysis! One thing I’d like to add: “Safka” name might be aftter SAFfron and KAliope. Oh! That’s a fantastic observation there, I totally didn’t catch that!